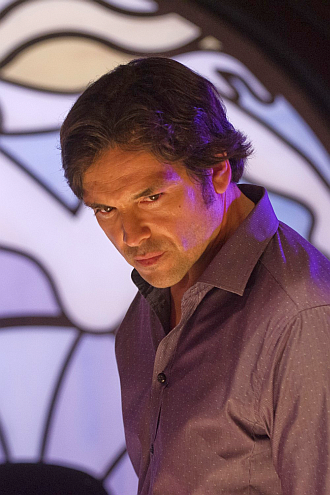 Dexter Daily: Jason Gedrick on Season 7: "The Variety of Writing Has Been Superb"
Jason Gedrick on Season 7: "The Variety of Writing Has Been Superb"
“I was the guy at the party in ‘Risky Business’ when the doors open,” says Jason Gedrick, 47. “Tom Cruise comes out of the door and nudges a guy on the shoulder. Here I am, a 16-year-old Chicago kid walking around with a gorgeous woman in a negligee. My hormones were raging, and suddenly the football injury that caused me to work at that sandwich shop seemed like a dream come true. “It was the time of my life,” he says. 'George' talked at Chicago Suntimes about the ghosts of his cinematic past, present and future. Are you the type of guy who can admit to loving Hallmark movies? Of course. I’m a father of three sons. I’ll sit down with them and watch these movies. I’ll turn them on, click off and then just end up circling back and watching the whole movie. Any insights on the current “Dexter” season? I did grow up on the North Side of Chicago and went to Gordon Tech High School. Getting started in acting was a complete fluke. I was playing football and got injured, so I took a job at a Potbelly restaurant on Lincoln. I met a terrific theater choreographer who was a waiter there and he convinced me to audition for extra work. I did “Bad Boys” and got to be friends with Sean Penn. One night he mentioned that he was going to hang out in downtown Chicago with a friend. Did I want to hang with them? The friend was Tom Cruise. Suddenly, I was cast in “Risky Business.” The only problem was I had no idea what I was doing as far as acting went in those days. I’d listen to Tom and Sean talk and my eyes were just ping-ponging. But Sean did tell me to go to LA and look up an acting teacher. Didn’t the words of Richard Burton also help to launch your career? I overheard someone say Sir Richard Burton needs water in Room 1628. He was in town doing “Virginia Woolf” with Elizabeth Taylor. I knew his room number and called him. He answered and I said, “Hello, Mr. Burton. My name is Jason Gedrick. I’m trying out for a movie. I know you know something about acting. I don’t. Maybe you could help me.” He said, “Keep your chin up and your feet on the ground and you’ll be fine.” It was good life advice. Now that you live in L.A., do you ever get back to Chicago?